Officials have been trying to make it safer for children to get on and off buses, both locally and nationally. Between a U.S. rash of bus-stop related accidents this autumn and Delaware’s pedestrian fatalities this winter, drivers and pedestrians, officials say, all need to pay better attention. Within a matter of days, children in Indiana, Florida, Pennsylvania and Mississippi were killed or injured on their way to school. Most of them were hit by motorists illegally passing stopped buses. “It’s a concern. We sweat it every day — the drivers and the transportation supervisors, all of us — we do see it, because people are speeding out there. There’s a lot of accidents. 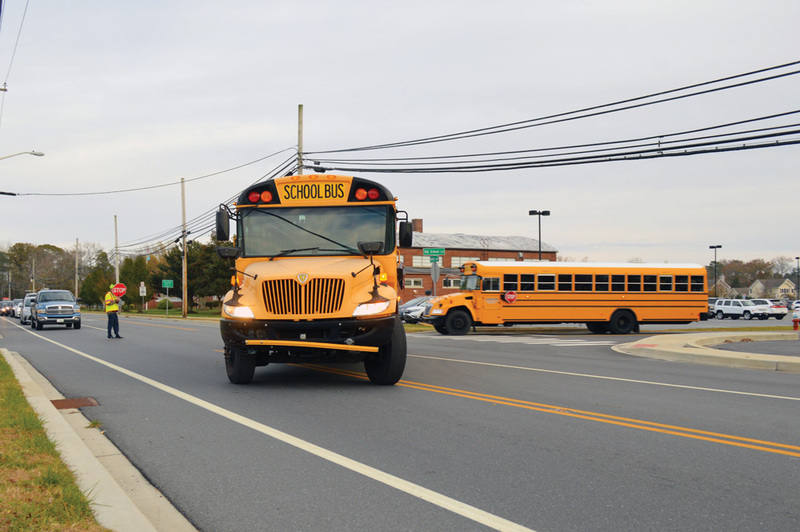 The majority of accidents are not our [bus] drivers’ fault,” said Larry Lineweaver, a supervisor in the Delaware Department of Education’s Transportation Office. His office helps to enforce transportation regulations for about 1,800 school buses that transport 130,000 pupils each day to the state’s public and charter schools. It’s all about distracted driving, said Mearl Layton, whose family owns Layton Bussing, based in Frankford. “We can be sitting in the middle of the road with stop signs out, and they’ll still go through. … It’s pretty much a national problem,” he said. The bus drivers are cautious, since they’re carrying precious cargo. But they can’t control the half-tired public driving to work. “You see some of them come through — they’re texting on their phones…” Layton said. It’s not a daily occurrence, but even one death is too many. “Knock on wood, we’ve been very fortunate,” said Lee Dean, a state trainer for school bus drivers. “In fact, we haven’t had too many incidences where students have been injured,” although a New Castle County child was killed several years ago at a bus stop. For safety advocates, it’s hard to say which is worse: people who don’t pay attention to the road, or those who intentionally break the rules. Some bus drivers see the same vehicles illegally passing every morning, like a bad habit, and other vehicles may follow their lead. Sometimes the public or school districts will ask police officers to monitor such hot spots. The Harrington Police Department nipped the problem by issuing tickets. Word gets around fast when people start getting citations. There were no reports of pupils being struck while approaching/leaving a bus in the 2017-2018 school year in Delaware. However, that report is incomplete until the Delaware State Police confirms all accident reports. For instance, the stats don’t yet include a fatality in which a bus aide was killed in a Route 113 collision in Frankford. In 244 reported accidents, 14 people were injured — at least three pedestrians, but not students crossing for the bus. Most school bus accidents (97 percent) only resulted in property damage. Overall, accidents in the last six years have generally increased, from 196 to 244, with a spike of 261 in 2015-2016. Delaware’s rate of illegal passing appears to be decreasing. In a voluntary one-day survey each spring, bus drivers are encouraged to report incidents of passing. With an average of 1,300 participants each year, passing reports varied from 572 to 1,233 in the past eight years. But the overall rate of incidents per bus driver has cut nearly in half (calculated with data of Delaware and the National Association of State Directors of Pupil Transportation Services). On May 4, 2018, about 1,100 Delaware bus drivers reported 572 illegal passes, including eight on the right-hand side of the bus. Incidents were split almost 50/50 in the morning versus evening, and from the front or rear of the bus. Small children can also be unpredictable. They’ve been known to dart across the street toward their parents, before the bus driver gives the OK, making it especially vital for cars to stop when buses are stopped. Bus drivers must also navigate around winter conditions, including sun glare, early nighttime and running deer. Yellow warning lights indicate that the bus is preparing to stop for students to board. Motorists should slow down and prepare to stop. If the lights are still yellow, motorists may only pass after coming to a complete stop. Red flashing lights and extended stop arms indicate the bus has stopped and children are getting on or off. Motorists must stop and wait until the red lights stop flashing, the extended stop-arm is withdrawn and the bus begins moving, before they can start driving again. Even without an injury or a close call, just for passing a school bus with activated lights, penalties for drivers can include fines, prison time or license suspension. But on four-lane roads, including Routes 1 and 113, drivers coming from the opposite direction to the bus don’t need to stop — just those traveling in the same direction. The buses extend their 6-foot crossing bar to keep kids in front of the bus and in the drivers’ range of vision. When planning bus routes, Indian River School District even tries to primarily collect kids from the right ride of the road, to minimize children crossing the road. Drivers also use additional safeguards. The IRSD wants exiting children to stop twice (at the arm and again at the bus driver’s mirror) before fully crossing the road. Some buses have been seen stopping in the middle of the roadway, slightly askew and into the opposing lane of traffic. That might be effective for stopping traffic from passing, but “That’s not how it’s supposed to be done,” Layton said. Parents are responsible for teaching kids to listen to the bus driver at all times and also to demonstrate safe road skills. Lineweaver described a New Castle County family that was hit by a bus because the parent led them to cross the road illegally, against a stoplight. Students should wait at a safe distance from the road, but still be visible to the driver. They should not approach the school bus until the driver says to, via the P.A. system. Even then, they should always check the roadway before walking across. Learn more at www.NHTSA.gov and www.doe.k12.de.us/domain/462.